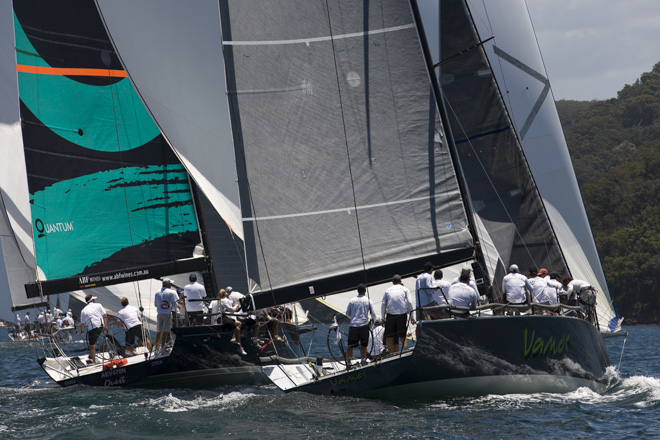 Three races and three different winners made for a diverse opening day of the Premier Composite Technologies TP52 Southern Cross Cup Regatta on Pittwater, to the north of Sydney. 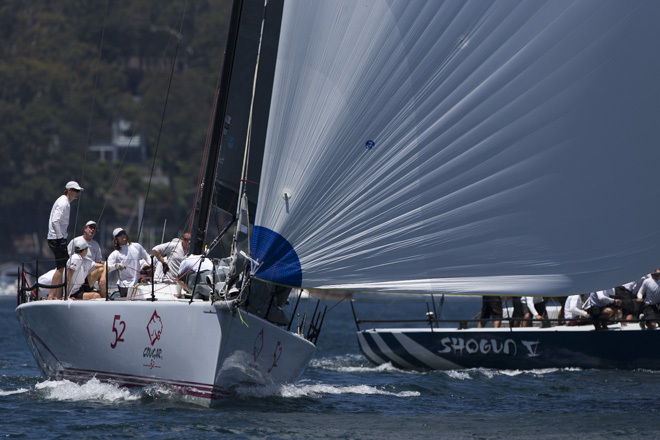 Pin end starts and insider knowledge of the lifting breeze that creates an elevator ride under Longnose Point split the results and gave Tony Lyall’s Cougar II from Tasmania the opening punch in the final round of the four-part series. David ‘Chappo’ Chapman, the 25 year-old tactician on Cougar II knows the local anomalies. Each school holiday he visited his grandparents on their boat in Akuna Bay around the corner in the Kur-ring-ai Chase National Park and together they explored the nooks of Pittwater and the Hawkesbury River. 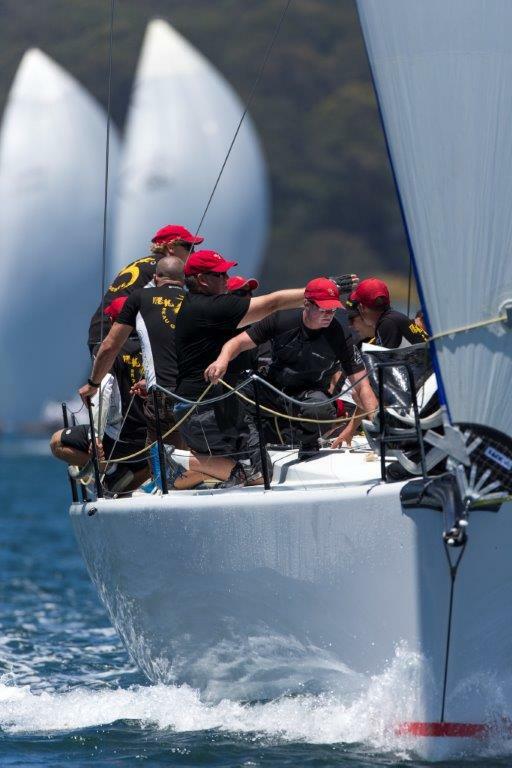 Chapman went on to develop his skills and compete at the upper echelons of youth match racing, including Pittwater’s annual Harken International Youth Match Racing Championship. Today he fused his knowledge and experience with the genetically enhanced talents of local Sam Treharne, son of 1983 America’s Cup tactician Hugh Treharne. ‘Chappo’ has brought the Midas touch to Tassie boats recently. He is the strategist on the Farr 40 Voodoo Chile, which is two up in the class’ summer series. “Cougar is a good boat in those breezes,” said Lyall of the nor’east sea breeze which started at seven knots and had doubled by race three.“The newer boats are much faster, but we can hold them in flat water.” On the 20 degree wind shifts he commented, “We get the same on the Derwent River so we were comfortable”. Today Chapman was up against an old foe from his Harken youth match racing days in Seve Jarvin, tactician on Bob Steel’s Quest, which is one point behind Cougar II on the pointscore. “Shogun and Beau Geste having their own battle definitely freed us up,” said Jarvin this afternoon at host club, the Royal Prince Alfred Yacht Club on Newport’s foreshore. “All three winners came off the pin end and we knew when the breeze was shifty that we could lift all the way along Longnose Point,” Jarvin added. Karl Kwok’s Team Beau Geste (HKG) and Rob Hanna’s Shogun V as expected were off fighting their own battle. 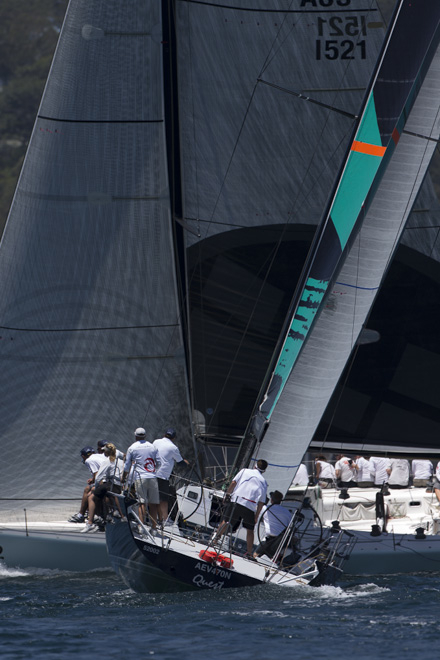 TBG’s helmsman Gavin Brady is a different vintage but equally ruthless as the young guns in the match racing stakes, and with loads more experience. TGB has installed some heavyweights on board in the shape of Team New Zealand America’s Cup sailors James Dagg, Tony Rae and Chris Ward, plus round-the-world winning skipper Mike Sanderson. With John Cutler unavailable they called up Sydney sailor Sam Williams, a regular on Guido Belgiorno-Nettis’ Farr 40 Transfusion, as tactician. All that star power didn’t translate into top grades for the TP52 series pointscore leader. “If you had to have your driver’s license for that course, we would have failed,” laughed Brady, delighted that the earlier generation TP52s won the day. TBG is third on a countback. Principal Race Officer Stephen Merrington added an amusing touch to his radio communication, relaying the cricket score to the crews during racing. The only sour note was the injury to Frantic crewman Murray Wright who was hit in the head by the boom and taken to hospital as a precautionary measure. 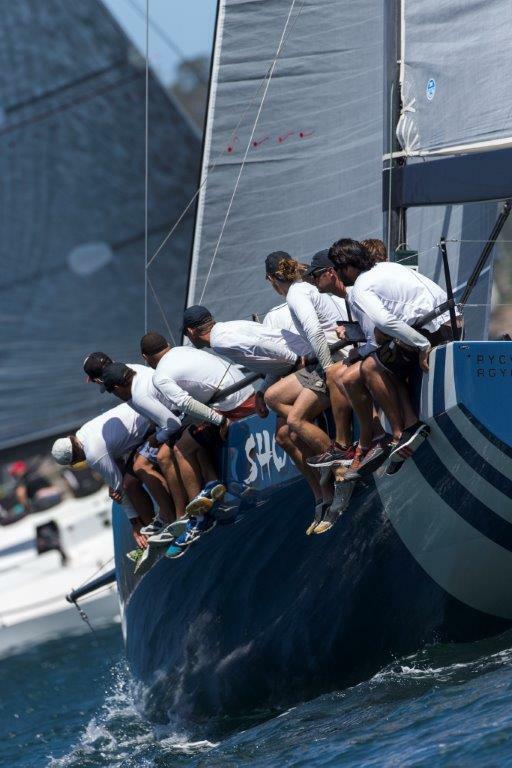 Racing will move offshore tomorrow, three windward/leewards scheduled to start at midday. The Bureau of Meteorology is expecting variable 10 knot winds turning southerly 10 -15 knots in the morning then tending south-southeasterly 15 - 25 knots in the middle of the day.